Cette adaptation sensible du best-seller de Jonathan Safran Foer séduit surtout par la performance envoûtante du petit Thomas Horn, vraiment exceptionnel dans la peau d'un enfant volubile, surdoué, emmuré dans sa condition. With its occasional flashes of honesty Extremely Loud and Incredibly Close mostly proves that Foer's source material is solid, that the author wove a tricky and dense story that added up to something; by condensing it and excising many elements, Daldry has untangled a substantial knot that needed to stay exactly the way it was. An emotionally potent, noticeably literary story of a precious boy's reaction to his father's death on 9/11. 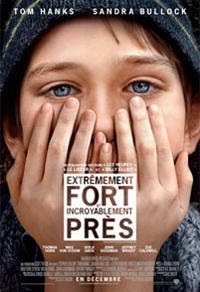 Le long métrage de Stephen Daldry est intelligent, raisonné, profond et stimulant. Le cinéaste Stephen Daldry connaît les ficelles qui font jaillir la source des pleurs (The Hours, The Reader) et n'hésite pas à tirer dessus, s'ensuivant de soudaines explosions d'émotion, accès soulignés par les mélancoliques envolées de piano du compositeur Alexandre Desplat et par une narration du jeune héros qui paraît appuyée et superflue. Overall, Extremely Loud and Incredibly Close is a very emotionally satisfying film, and something that manages to be life-affirming despite dealing with one of the more tragic events of our generation. Le récit, à la fois drôle et dramatique, captive malgré de légères baisses de régime et une finale appuyée. Les thèmes happent et bouleversent, au même titre que toutes ces rencontres qui sont effectuées. Solidly crafted, impeccably acted and self-important in the way that Oscar loves, Extremely Loud is also incredibly close to exploitation. Unfortunately, the film's contrivances undermine his efforts. Screenwriter Eric Roth's adaptation leaves out large swaths, dropping key characters and radically changing the behavior of others. Alexandre Desplat's swelling score grows overbearing. In truth, Extremely Loud & Incredibly Close isn’t about Sept. 11. It's about the impulse to drain that day of its specificity and turn it into yet another wellspring of generic emotions: sadness, loneliness, happiness. This is how kitsch works.